For the last 10 years, the Case Foundation has studied, supported and celebrated how the Millennial generation engages with social issues and causes. Much has changed over a decade and we’ve learned a lot. When the foundation started this work, we spent a lot of time explaining the relevance of studying the new approaches Millennials were taking to social change, and who they wexre as a population. 10 years later, the Millennial Impact Report—the cornerstone of our decades long work—is the largest body of data and analysis on Millennial cause engagement, with information on how more than 100,000 U.S. Millennials engage with social issues and causes. Through the Millennial Impact Report, we’ve gained a wealth of important knowledge which we’ll be sharing over the next few months. But one of the key elements that we think is central to this work is the deepening of the understanding that the Millennial generation isn’t a monolith. It’s actually the most diverse adult demographic in the U.S. 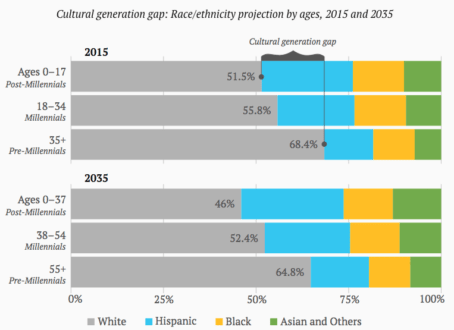 According to the Brookings Institute, the Millennial generation is more than 10 percent less white than all older generations (44.2 percent minority compared with 31.6 percent minority). Millennials are also far more likely to identify as LGBT than older generations, according to January 2017 findings from Gallup. Specifically, 7.3 percent of adults aged 18 to 36 identified as LGBT, while 3.2 percent of those aged 37 to 51; 2.4 percent of the 52 to 70-year-old respondents; and 1.4 percent of the over 70 respondents identified as LGBT. Many Millennials are influenced by common experiences, such as the aftermath of 9/11 and coming of age during the Great Recession, yet—unlike the Greatest Generation’s experience with the Depression and then World War II—these society-wide experiences have not had the same impact on the degree of activism and attitudes of everyone in this age group. “White/Caucasian: The top three issues of interest among this group turned upside down from the prioritization of the aggregate’s top three issues. Healthcare reform topped their list, followed by employment (job creation) and then civil rights/racial discrimination. Spanish/Hispanic/Latino(a): Unlike any other racial/ethnic group, this segment chose immigration as the number one issue of interest. This group identified civil right/racial discrimination as its number cause of most interest. Black/African American: This group is in line with the overall sample, identifying civil rights/racial discrimination as the top area of interest, followed by employment (job creation). Asian: This is the only group that named climate change as their top area of interest, though it was followed closely by employment (job creation), civil rights/racial discrimination and healthcare reform. Gender also influences cause engagement and activism, as Achieve’s director of research, Amy Thayer explains in her powerful piece on Millennial women, Millennial Women: Hear them Roar. For example, self-identified women reported lower levels of cause engagement and confidence in their own—and the ability of organizations—to create the change they want to see compared to their male counterparts. (41 percent of women believed strongly in their ability to address social challenges compared with 65 percent of men). Education influences the methods and frequency of cause-related actions among Millennials with the least educated being most likely to report taking no action and the most highly educated reporting taking a greater number of more diverse actions, including: contacting representatives, participating in marches and joining a nonprofit board. Politics also matter. The 2017 survey revealed that the majority of Millennials are dissatisfied with the current president and it is a key factor behind their post-election activism. They’re taking actions against policies and practices they don’t support, like the animated response to the 2017 travel ban. But, not all Millennials think the country is going in the wrong direction, and that segment who voted for and continues to support the president, reported the most active cause engagement in 2017. Their support for the president also correlated with different methods for engagement as well as a greater propensity to identify with activist labels, compared with non-Trump supporters. In short, by trying to label Millennials with a broad brush—whether it is slacker or activist, engaged or apathetic—misses the essential nature of the generation. At its core, the Millennial generation is diverse and their opinions and insights and perspectives reflect that diversity of background, experience and lifestyle. 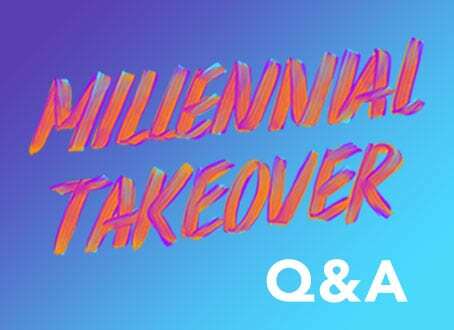 In our 10 years of sharing research on how to engage with the Millennial generation as social changemakers, we’ve had a front row seat to witness a rise in the Millennial voice about the issues they care about and the way they perceive their power to create change. We’ve all seen how that voice is influencing greater social responsibility in corporate practices and modernizing nonprofit outreach. Now, the latest Millennial Impact research from Achieve identifies the important nuances between specific segments of the Millennial population. This research shows the issues that matter to one group of Millennials don’t necessarily matter to everyone; therefore, to communicate effectively and activate Millennials, it’s essential to dig in beyond just their age-group. According to the findings, if you want to connect with Millennials on causes and engage with them, it matters where they live, their education level, their gender, their race and even their opinion about the president. Not only do the social issues that matter most vary by these factors, their level of confidence in their capacity to create change, their willingness to act on behalf of others and their interest in national or local causes are correlated. And many of the leading marketing firms and brands have sought to connect with these distinct groups through extensive micro targeting and by designing products and outreach for specific subgroups. To find success, it’s imperative that the non-profit world design messaging in a similar way. The 2017 Millennial Impact Report is one tool to help begin to build those relationships with Millennial cause supporters and we urge you to download your copy here. Stay tuned for further learnings that we have gleaned over the past ten years of Millennial focused work and details on MCON, the annual conference where the Millennial Impact Report learnings are brought to life and tens of thousands of passionate individuals come together online and in-person to channel their enthusiasm into action for today’s most pressing issues. Sean Tennerson is the Program Associate who contributes to the Foundation's social innovation efforts. Her favorite thing about her role is building relationships with grantees.